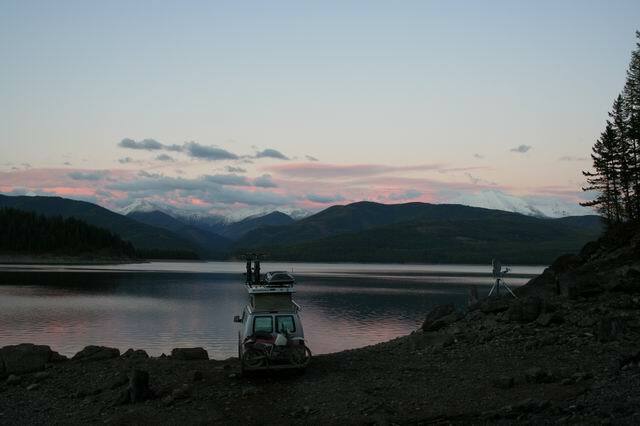 After falling asleep to the burbling, bubbling sounds of the Selway River, we broke camp and hit the road again. After a very brief stop in Darby, MT (kind of a creepy tourist trap, if you ask me), we landed in Hamilton, MT. Since I had a serious hankering to see the new release of the Corpse Bride (evening showings only), we decided to find camp, and come back into town for a "hot date" (dinner and a movie). 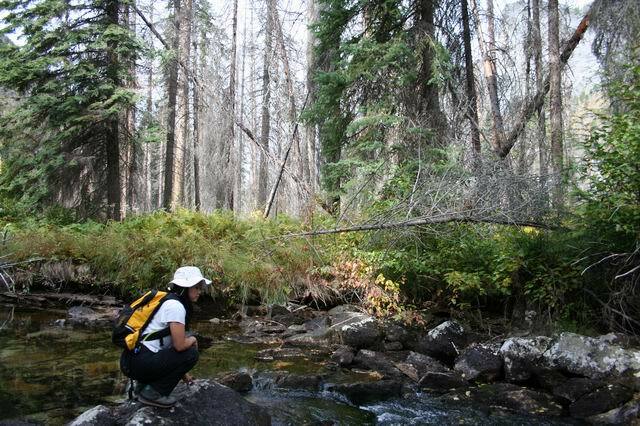 We found a nice little primitive camp site by Blodgett Creek, near a trail head. 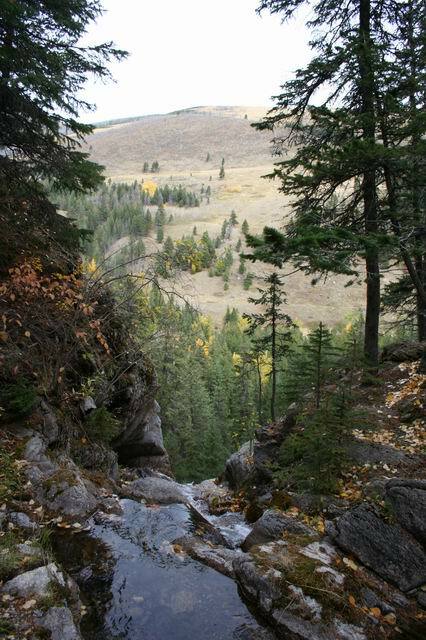 The geology was stunning, with its shear faced ridges shooting up from foot hills of Boulder fields, and the cheerful creek bubbling along the narrow valley dividing the peaks. After making camp, we hopped on the motorcycle and buzzed back into town. We didn't find too much off the the main drag that look open so we went with the old standby - Subway. The movie itself I would give a solid B. Being that I am an avid Tim Burton and Danny Elfman fan, and have seen a fair bit of their stuff, I can give this grade with some conviction. The artistry was great, although compared to the Nightmare Before Christmas, it lacked some of the detail that comes from handcrafted materials. For instance, Emily (the corpse bride) was obviously partly if not all CGI, and the result was that the textures and detail of her gown were of lower quality than say, Sally's in NBC. Granted, her gown did do a lot of fancy stuff, movement, et cetera, but I stand by my support for less CGI in this case. In Erik's opinion, the color processing they used resulted in such a monochromatic quality to the movie, that it looked rather "washed-out". Second complaint, the characters lacked heart. Pardon my pun, but I had a difficult time "falling-in-love" with the Victor because he was a doormat, Emily because she was a bit of a ditz, and Victoria because she didn't have enough air time. It was also a little difficult to accept the "love at first sight" premise between Victor and Victoria. Third complaint, the lyrics! I couldn't believe that those songs were actually penned by the same Danny Elfman who wrote "What's This? ", or "Making Christmas", or "Kidnap the Sandy Claus"! With all that said, I heartily wait the release of the next movies on my avidly-awaiting-list "Wallace and Grommet and the Curse of the Wererabbit." and the next Harry Potter Movie (of course!). And BTWY, WHEN are the X-Men getting their movie out already? The next day we hiked part way up the trail, along Blodgett Creek, to Blodgett Lake, as I said before the geology was beautiful, we got side-tracked from the actual trail by nice little scrambles over rock fields, and over rocks paths crossing the stream. After our hike we headed into Missoula, home of the University of Montana, and a fair bit of money, I am supposing. They even have micro-equivalents to "the Ave" and "U-Village" although they are much closer together and arranged on parallel streets rather than being separated by a mile as in the case of UW. The folks at the visitor center were very friendly and gave us their recommends on a nice coffee house. We spent a fair number of hours at Liquid Planet, (the recommended), surfing the net, sipping Mochas and Chai Lattes, and munching Crepes. I would recommend them if you are looking for a more club/bar atmosphere. We spent the night at an RV park. The next day we went back into town, checked out a couple more shops. I recommend the Fact & Fiction Bookstore, nice proprietor, really nice displays, good selection. For lunch I really recommend the Catalyst, great "little coffee shop" atmosphere. They'll be moving soon, so I hope that they don't lose that great atmosphere. Finally, yesterday we made it into the town of Hot Springs, MT looking for (what else?) hot springs. We ended up at Wild Horse Hot Springs Resort. They have nice private "plunge" rooms, they were very nice and thoroughly enjoyable. So we decided get an RV hook up for a couple nights and hang out to catch up on some tasks. 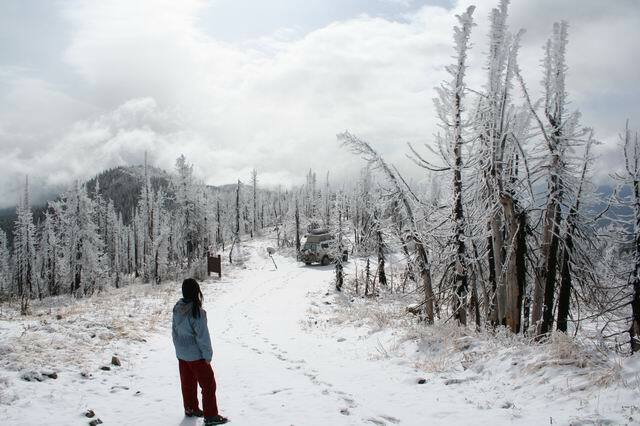 We are now sitting in the middle of a snow-storm on top of a peak just north of Whitefish, MT. 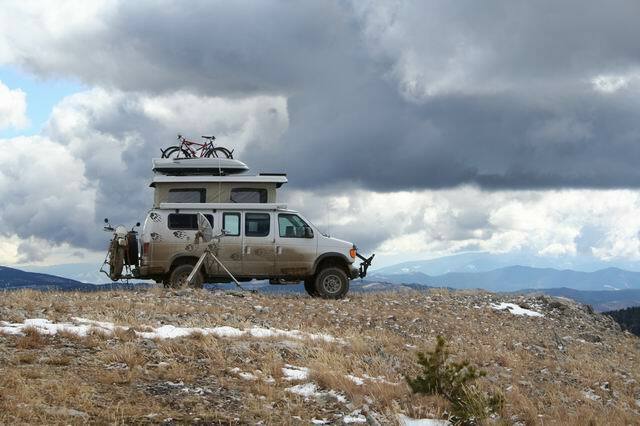 Winter is truly coming, and this should be a good test of our winterizing of the van. Already we have learned a few things: The tripod for the satellite dish probably shouldn't be in the motorcycle rack when we head from wet into freezing areas. All of the tie downs were frozen solid, and the tripod itself was coated in frozen mud. It took about 20 minutes for me just to untie it and chip the icy mud off of the important areas. The whole lower-half of the van is coated in a veneer of frozen mud from the wet dirt roads down below. The scenery is pretty stark too. Visibility is only a few hundred yards as we are above cloud-base, snow is swirling around, the wind is howling, and the forest is composed of bare black burned trees (looks like a forest fire went through here within the last couple years) covered in hoar-frost from the fog. The furnace is keeping us nice and toasty though, and the stove worked flawlessly to cook up a nice spaghetti dinner. I'll probably try to rig up something to bake some brownies for desert in a little bit. Current elevation is 6663', temperature outside is 27.5 and dropping at 7:45pm Mountain time. The last few days have been a lovely tour of western Montana. Amy details more below, but we basically traveled from the end of the Magruder Corridor up the Bitterroot valley, past Flathead lake to Whitefish over about 4 days. The van has behaved well, though we had a few breakages that will need addressing: One of the pins holding the front anti-sway bar links was poorly welded, and the weld came loose (inspection reveals NO penetration of the weld into the axle mount except for a couple places about 1mm in diameter). This should be easy to fix at a welding shop, and isn't much of an issue as long as we remember to take the pin out if we un-clip the sway-bar for off-road activity. Second was a rather dramatic and violent departure of the slide-out pantry cabinet from its rails when traveling on a wash-boardy road. The latch appears to have worked itself loose from the vibration, then the catch-strap popped loose (I don't think it does anything really), then the pantry, with significant weight in food goods, extended all the way out and popped the ends off the rails it rides on. We suddenly had ball-bearings and food bouncing around the cabin, wondering what in the world had happened. The rails all need to be replaced (they are bent, the ends are broken, and some of the bearings are missing). I also need to look into a more positive latch, perhaps a sprung barrel latch is in-order. It is temporarily back together until we find a well-stocked hardware store and get some replacement rails and a latch. This morning finds us with a completely different view out the front from just two days ago, and only about a 1hour drive from the prior spot. 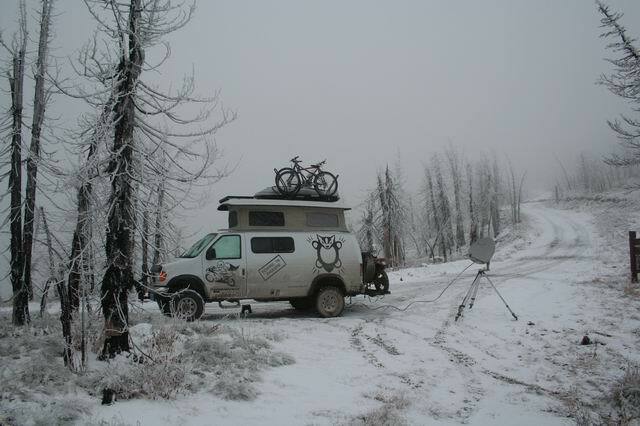 On Tuesday (the 4th) we got up to one to two inches of new snow on the van and blanketing everything around. We had breakfast, and I climbed up on the roof to sweep off the solar-panels for power. The landscape was magical, with the sun making its presence known through the fog that was blowing by. 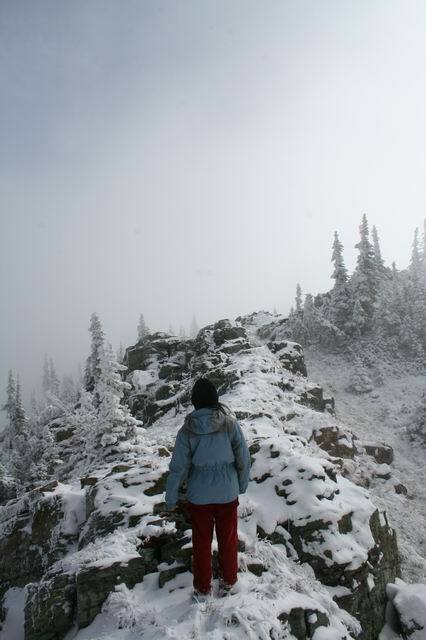 We went on a hike for an hour or two, exploring the local area in the wind, thin fog, and snow. By noon the sun was coming through, and the snow was starting to melt, so we headed back to the van so we could do some work on the computers. Yesterday, after participating in a conference call for work via the satellite dish (and probably setting a precedent I will regret later), we headed down the hill into Whitefish so that we could thaw out our grey-water tank (which had frozen at the outlet and overflowed), and pick up a few supplies before searching for our next front-yard. 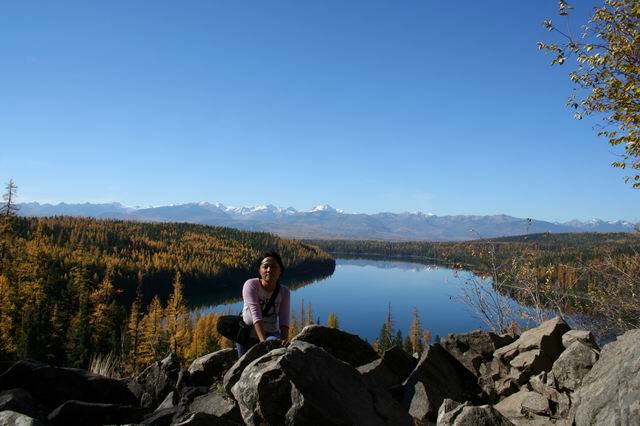 We ended up on the shore of a large lake, with a magnificent view of the lake, the forest, and the snow-covered mountain peaks a few miles away. Quite a colorful contrast to just one day before. I added a bunch of stuff to the "Daily Life & Random Thoughts" page. Most of this will probably get its own page when I feel like partitioning it more. Subjects added include: Why did we choose diesel for everything, how do we get online, how are we navigating, and a little on who we are. It has been a few days and we have traveled a bit in that time. On the morning of the 7th we woke up to pouring rain, low visibility and thunder. The rain and some patches of sun made for very pretty scenes once in a while, but we had been hoping to go hiking and this put a damper on that enthusiasm. We checked the weather reports and it looked like the east side of the mountains would be sunny so we packed up and headed out. We traveled past the southern edge of Glacier National Park, over the continental divide, and into the sun. Once in the Blackfeet Indian Reservation we headed south on some BIA dirt roads so we could stay nearer the mountains and avoid the more traveled highway 89 (which we had taken a couple years earlier and was quite boring in this area). A few miles south of the reservation we saw some interesting geology and headed west on a forest-service road into the mountains again. We setup camp for the night in a meadow under some snow-caped peaks. 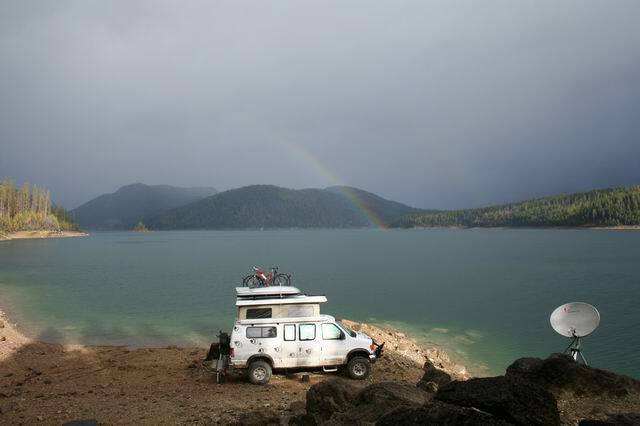 The next morning we hiked to the end of the forest service road and surveyed the hiking trails emanating from there. One led to a waterfall, and it looked reasonably close on the map so we headed that way. 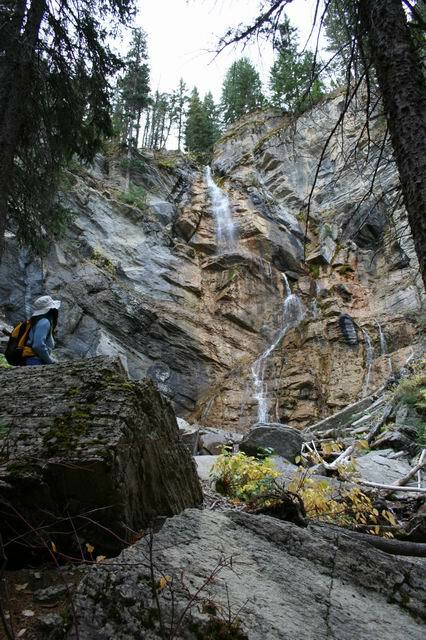 The waterfall was only about a quarter mile in to the base and was quite pretty. After having breakfast (powerbars, yay) at the base of the falls, we headed up another trail that branched off the one to the falls. We went a couple miles up into the forest and got some nice views of the mountain peaks and vegetation regrowth after a forest fire that looks to have come through the area about 12 years ago. We even saw a few bear tracks on the trail in one muddy spot. On the hike back down we diverged from the main trail a bit to find the top of the waterfall, where we had lunch looking out over the valley below. After heading back to the van we packed up to head down towards Helena for an opportunity to catch the new Wallace & Gromit movie, re-fuel, and get some groceries. We were able to catch a matinee of the movie (which we both liked), grab a latte at a coffee shop (we ARE from Seattle) and then head to a campground for the night after shopping for groceries and diesel. The next day (Sunday) we left the campground early in the morning (it had only 1 other occupant, a huge bus based RV that left their generator running ALL NIGHT LONG). We looked over our maps and saw a lookout on a tall hill nearby and headed up for a more scenic and solitary camping spot. At the lookout we have a view of the entire valley containing Helena and the mountains and hills in all directions. At night the valley lights are quite pretty and reassuringly far away. While exploring the top of this hill (it has a number of ridges of almost constant height, with roads along them) we nearly got stuck a couple times in very slippery mud from the thawing snow that is up here. I would really like to add a locking differential or two to the van at some point soon so this isn't as much of a concern. After traveling the muddy and dirty roads above Whitefish, through the Blackfeet reservation, and finally up to this last lookout the van is pretty much brown. Many of the lower graphics are not even visible any more due to a coating of mud and grime. On Sunday, October 9 th , we broke camp early to avoid paying camping fees. We had pulled in late to the Black Sandy State Park camping site, and found the camping fees exorbitant, especially since many of the services were shut down (no restrooms, no running water, no power). They wanted $15 for no water, no electricity. I mean we could get full hook-ups for less than that, in some places. 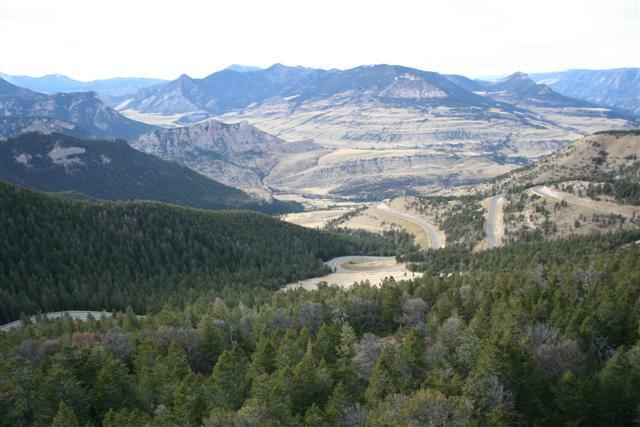 We consulted maps and decided on following the "Figure 8 Scenic Drive - From York to York " into Helena National Forest . We drove the windy rode through several valleys edged with beautiful rocky peaks, ended up at our intended campsite and found it to be dark, overgrown with vegetation and trees, and poorly maintained. So instead of stopping there, we followed the signs to a lookout tower on Hogback Mountain . 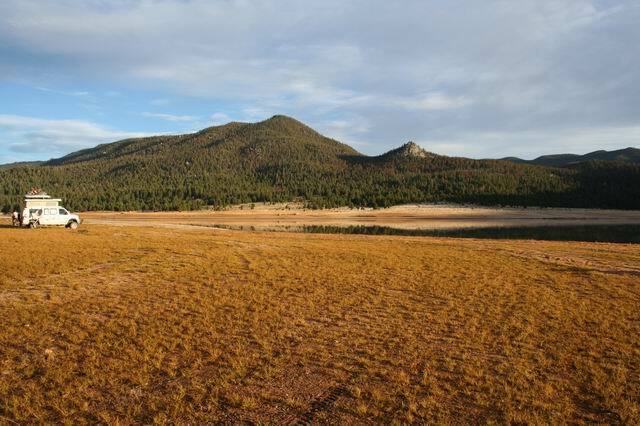 Hogback turned out to be a very flat-topped peak with a number of ridges flaring out from a central plateau. 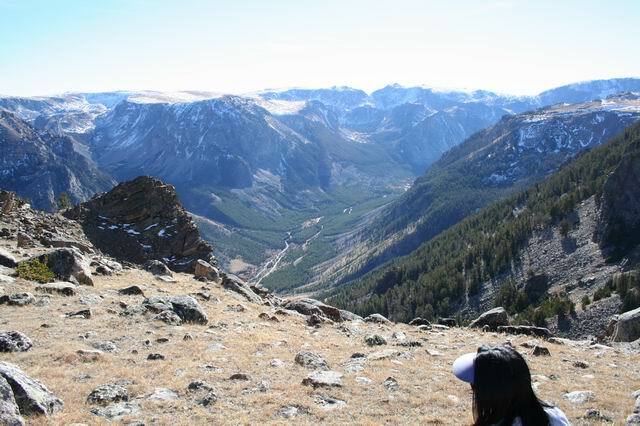 It had great 360 degree views of the Helena Valley , its lakes, and the surrounding mountains. At the Northeast foot of the mountain were a couple of beautiful grass meadows, shining autumn gold in the late midday sun. We decided on a spot on the mountain, with a prime view of the valley below. 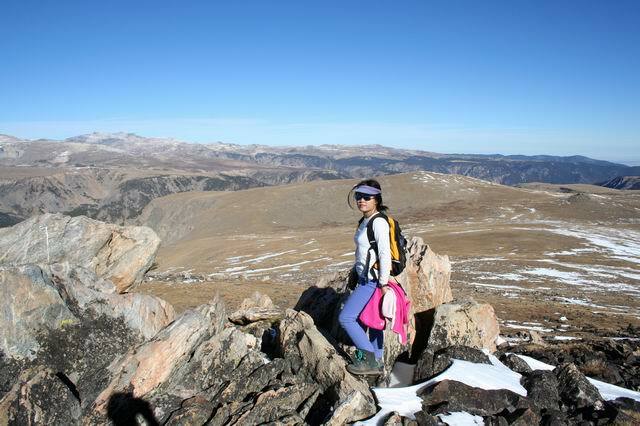 The weather conditions on the peak were at freezing, but otherwise quite nice. And the greenhouse effect of our windows kept us balmy inside the van. Later in the night, we discovered the price of being parked in a place with a good view from the top: wind. That night, or rather really early next morning, the wind had picked up. Gusts of 30 mph buffeted our penthouse bed, which shook and burbled like so much sail cloth. Our little top held up through the night and we were no worse for ware except for some sleep deprivation (and Erik running outside to lash frozen boulders to the Satellite Dish's tripod to stabilize it). The next day, the wind held steady all day long, the temperatures were rising and the frozen ground was thawing to mud. 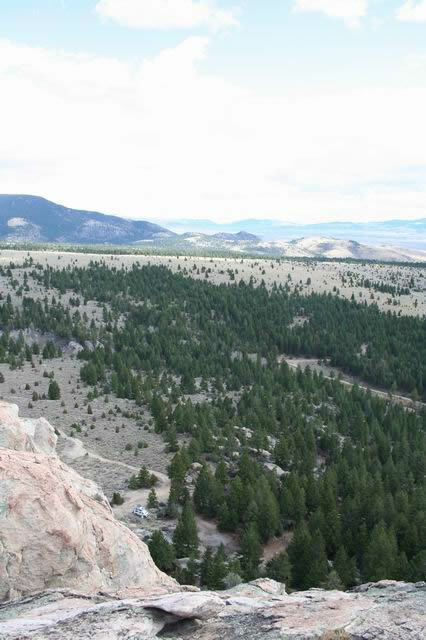 We took the opportunity to hike out on several of Hogback's ridges, scrambling over stumps and rocky soil. It turned out the wind that we had taken notice of was localized to where we had parked, and as soon as we hiked further out from our spot, the air was pretty much calm. On Tuesday, we got some more tasks worked on, inside, and took another couple of hours to explore a different ridge running off of the eastern side of the peak. We packed our things up Wednesday morning to head back to civilization. We had accepted an invite from some of our Sportsmobile friends in Kalispell for a home cooked meal, so it was time to go find an RV site and get all spruced up. We were also running pretty low on juice, so a drive was at least in order, 3 days of mostly cloudy weather did not help us much! Plus I was eager for just a taste of city life again. 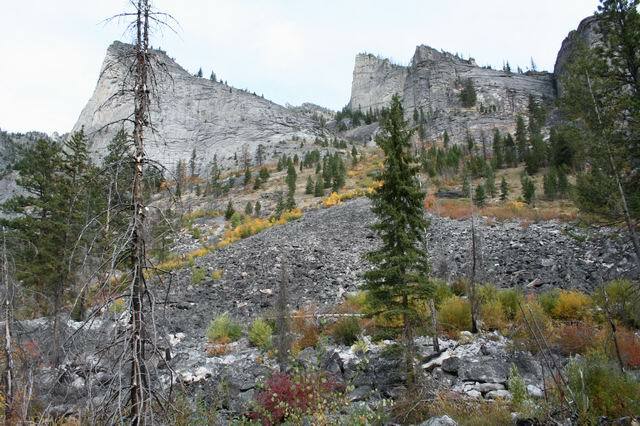 On our way to Missoula , we stopped by a geologic curiosity call the Refrigerator Canyon . 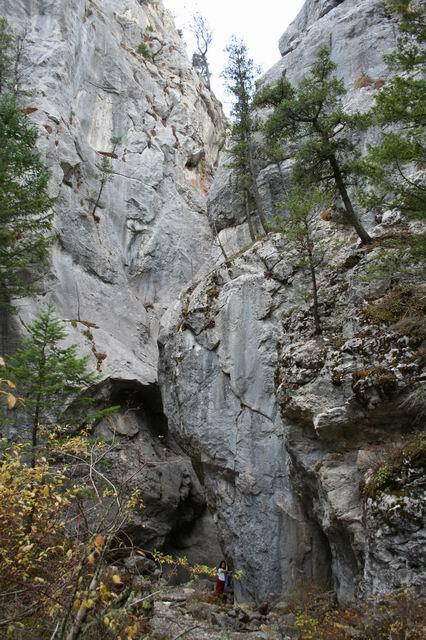 It was a very deep narrow canyon that was said to maintain a temperature 20 lower than the surrounding areas. It was a mini 15 minute hike, nice nevertheless. Then we made a bee-line for a familiar RV-site (Jim & Mary's) and plugged in for the next 2 nights. Thursday, we ran some errands, soaked in some Starbucks, and some rain drops. We had taken the dirt bike instead of the van, which was fine except there was a little issue with the rear tire rubbing the muffler (to be addressed soon), which made my ride a bit like "getting your teeth rattled out of your skull". That evening, I had the great serendipity to have been practicing yoga in the laundry room (whilst doing laundry) when a lady in the connecting lounge room spotted me and inquired if I might be interested in joining their yoga class that was just about to start. Would I?!! I guess it was just meant to be! Anyhoo, I left the remaining laundry work for Erik (my faithful servant, teehee) to finish and I attended the hour-long Yoga session. It wasn't Power or Ashtanga, but it was free and it did help to ease my worries-of-late, so I was immensely grateful. Afterwards, I had a nice chat with the instructor about her yoga instructor's training and my aspirations for becoming certified. She was very positive and encouraging. Friday morning, after a couple days worth of showers and lattes, we were excited to visit our new Sportsmobile friends in Kalispell. 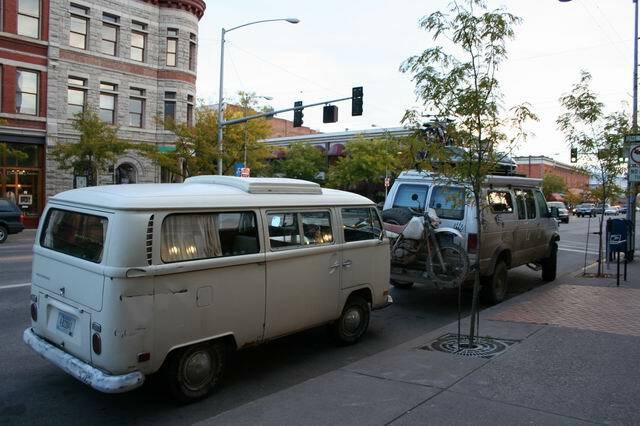 Friday afternoon, we pulled into Kalispell and met up with some friends with whom we had been corresponding. Shortly after arriving at their place, we were off (just four of us, Pat, Erik, me, and Abbot a border collie. no babysitter) to check out some local mountain biking trails called the "Pig Farm". The "Pig Farm is a maze of trails weaving between trees, and past the shores of a number of look-alike ponds swathed in golden meadows. The somewhat rocky soil and plentitude of sizeable roots on the trail provided enough of a challenge for an uber-novice like myself. I'm sure I held the guys back, but they didn't make too big of a deal about it, which was cool. We did a short (but sweet) hour long loop. It was really nice having Abbot along, he would run along jingling merrily as he went (bear bells) and every time he came across a pool of water, he would plop down into it thoroughly enjoying himself. That night, we enjoyed a cooked dinner of polenta with yummy black bean, spinach, and sun dried tomatoes. Saturday, the early morning clouds looked a bit threatening, but later proved to be just bluffing. After some coffee, and admiring one of John's ritual morning glue-with-construction-paper-and-colored-pencil-and-googley-eyes compositions, we left to go exploring the Jewel Basin area. The Jewel Basin was named, at least I believe for all of the jewel like lakes that decorate the face of the basin. We hiked from one of the more popular trail heads up to Mt. Aeneas (elev. 7529) across its ridge, and down to the Picnic Lakes before looping back. There was just the right amount of exposure (a climbing term), to really get a good feel for the height of the peak. 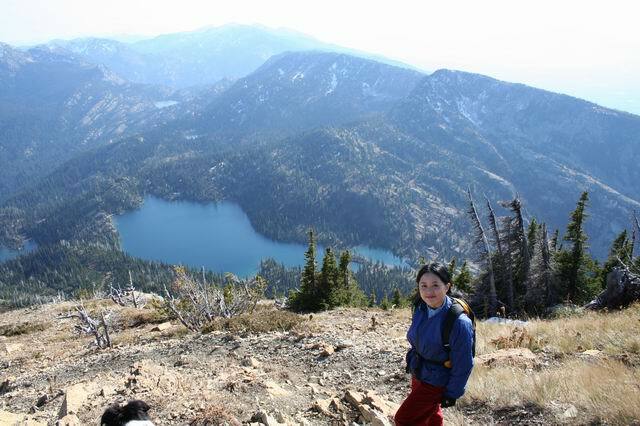 As we hiked along the somewhat narrow ridge, we could see a great view especially on the left of the how the terrain plunged down into the basin towards the lakes below. To our right, was a view of Flathead Lake and behind us, Whitefish. Sunday, after yummy morning pancakes (courtesy of Pat), Rebecca and I took off (with Abbot of course) in the afternoon to go mountain biking again. This time we went to a different trail system and met up with one of Rebecca's friends. The ride was great, probably the most downhill stuff that I've done in a long, long time! I was finally getting the hang of going screamingly-fast down very bumpy, stumpy, rock embedded stuff. I even let off of the brakes for several stretches. Meanwhile, back at home base, Erik and Pat were left to watch the kids, and show-and-tell, compare, and discuss Sportsmobiles and places to take them exploring. I'm pretty sure that they both came away with many notes, ideas, et cetera. After Rebecca and I returned, got cleaned up, and Erik and I ran some errands (our search for a Wyoming Gazetteer continues), we did an hour of yoga (one of Rodney Yee's tapes, Intermediate Yoga - not bad for a tape), very cool. It was a babysitter evening! The four of us went out to a lovely little French restaurant, La Provence, in Bigfork. On the drive over, we passed a pretty messed up car by the side of the road and there were little pieces of "Bambi" everywhere. I believe that we had heard somewhere that Montana is known to be the state with the highest or nearly highest number of deer related accidents per annum. Anyhoo, it was a celebratory dinner for Rebecca's birthday. I ordered a scallop and shrimp dish, and Erik and Rebecca both ordered Ahi Tuna, and Pat ordered lamb. The food was all great and only to be eclipsed by the perfect Chocolate Souffles that we had for dessert. Mmmmm! Monday, early afternoon, we packed the van for the next leg of the trip and took off heading south. Many thanks again to Pat, Rebecca, John, Sabrina, Abbot, and Bean for the wonderful hospitality and friendship! I'm sure we'll caravan together soon! We work up this morning to a beautiful view of the fog rising off of Delmoe Lake in Deer Lodge National Forest . We are currently hanging out in the van, doing some much needed catch-up on our computer related tasks. Earlier, on Monday, we had stopped by the Swan Lake Visitor's Center to inquire about the campsites near Holland Falls , as we had intended to make camp early. It turned out that their information on the campgrounds was a bit out of date, as all the sites were closed and gated off. I was pretty much a walking zombie (need sleep!) so instead of immediately checking out the Falls hike, we decided to find a good spot to camp. Ahhhh, gravel pits! - A badger's best friend. We ended up finding parking on the hidden side of a gravel pit. It was not at all a bad location, clean, hidden, not much traffic and we were able to aim the dish. Tuesday morning, we drove over to the Holland Falls trail head (broke camp a bit late around noon), and opted on the shorter trail, just to the falls. We were itching to move on, as it was. The hike turned out to be (as the books labeled it), a nice 3 mile day hike/stroll, which ended up at the mid point of Holland Falls, a beautiful cascade rushing out from a rocky promontory. 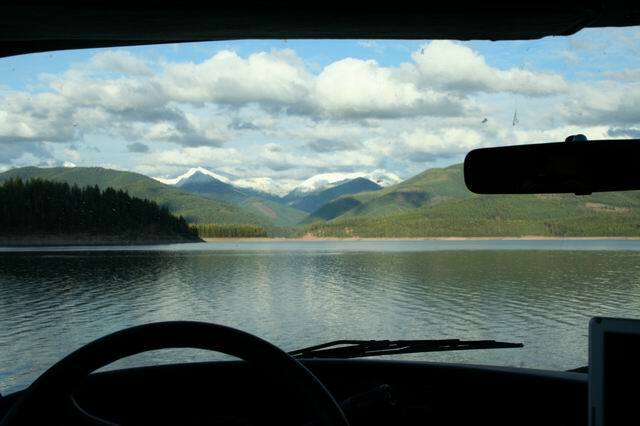 Opposite of the falls was an idyllic view of Holland Lake , with its surrounding hills enrobed in a cloak of brilliant green conifers and golden larch, and off into the distance, the Mission Mountains. After our hike, and lunch, we were off once again. Due to our late start, we made it as far as Butte before starting to look for a campsite, because Erik had a critical conference call the next day that needed the dish access. The drive into Butte was beautiful (especially the drive into Deer Lodge), the geology was markedly different in comparison to the rocks and soil up north. Absent were the deep purple soil, and sharp-edged grey-white rock characteristic especially of Helena and Missoula . In its place were rounded sand colored boulders, and rocks similar to the "Pancake Rocks" that we had seen in New Zealand . 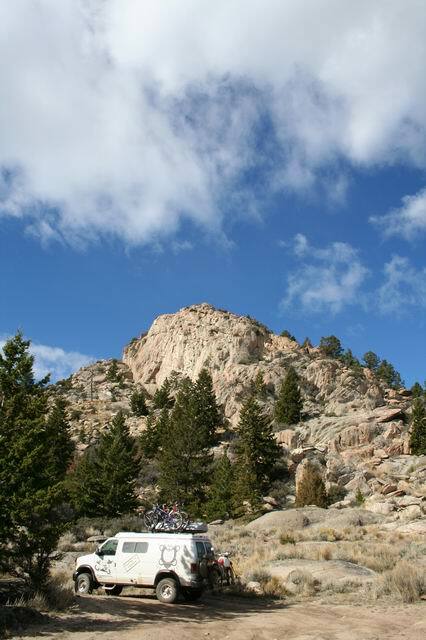 On our drive to our camping spot, I noted a peak that I was definitely going to climb before we left, and there were also a number of ORV trails for exploring. It looked like a promising place! 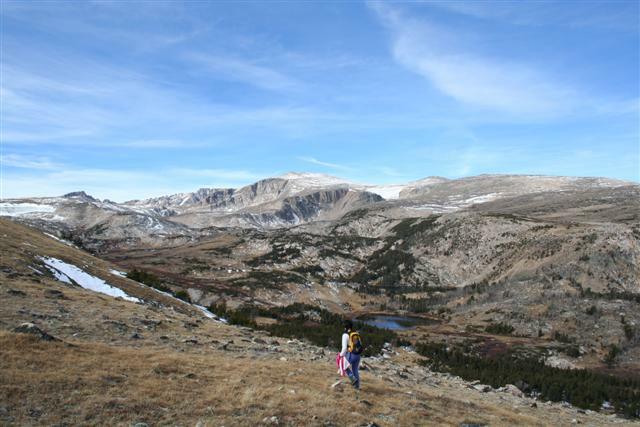 This afternoon found us camped out on the edge of the Hellroaring Plateau of the Absaroka Beartooth Range. 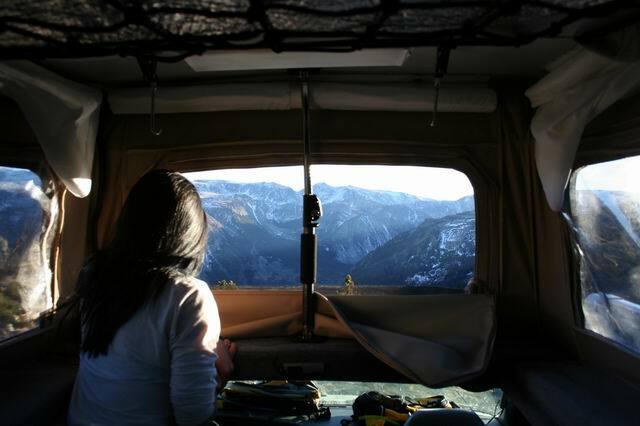 I took a long catnap, warmed by the sunlight streaming through the windows, while Erik did some work and contemplated the spectacular view through the front windshield - snow dusted peaks just a shout's distance across a canyon. Later in the morning, on Wednesday 19th, we decide to circumnavigate the perimeter of Delmoe Lake. Parts of the shore were strewn with large granite boulders and the sandy remnants of boulders long-since decomposed. Since it was late in the season, the lake had receded and this was especially evident on some of the shore edges which where ankle deep with mud and proved to be a mucky-business to traverse. Half-way around, it started to sprinkle and blow, but was not too unpleasant otherwise. After we got back to the van, we hopped on the dirt bike and went exploring on some of the local trails. We found a jeep track that lead to the base of Spire Rock, a peak that I had been eyeing since we had driven in the night before. It looked traversable by the van. After a late start Thursday morning, we broke camp and heaved our van up the jeep track that we had found the previous day. The track turned out to be easier to climb than we had expected. Whoohoo! Camp that night was at the base of Spire Rock. Very cool. That afternoon, we scrambled up the rock. It was a neat peak, with lots of exposure (read: prime chances to go tumbling to one's great peril), which made for great and exciting views. We actually had to use some of our rock bouldering skills, which was a delight to me. I actually made use of my rock climbing shoes! The view from the peak was the cherry on top of a great, moderately-technical (thus interesting) climb. 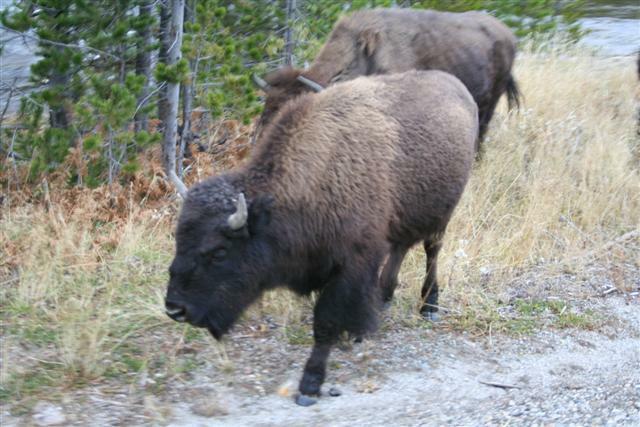 Friday morning, we broke camp and headed for Bozeman, Montana. We arrived in town, and in our ever questing desire to find a Wyoming Gazetteer, we stopped by a Borders Bookstore. And... We were again disappointed! We proceeded through town and made a trip onto the U of M, Bozeman campus for a tour. Of remark was how similar the architecture of U of M was to our own alma mater, U of W. Go Huskies. Next, we went to wet the ol' whistle, we headed into town for some coffee and atmosphere. But first, we went to a local independent bookstore to look for a Wyoming Gazetteer and they had only one left, so we purchased it! Yipee! Our search was over! After an inquiry at another local bookstore, we made a beeline for the Leaf and Bean for some Mocha and 'mosphere. It was time to find camp, so relying on our Lonely Planet, we headed for the Bear valley Campground (supposed to be open in October), on the outer edge of Bozeman. They were closed! Boo on Lonely Planet. After consulting our Gazetteer, we decided to check out another potential spot in Livingston. It turned out to be a full hook-up RV site, and they were open, so we went with it. So for Friday and Saturday night we were plugged in. Whoohoo! Warm, steady showers and the use of my hairdryer, which by the way was pooh-poohed by some BUT which I have found plenty of opportunities to use - Thank you very much! It's simply not civilized without my blow dryer. Saturday day, we made a short foray into town (Livingston) and got some Mochas at Chadz (weird flaming decor, with a couple of "metros" manning the espresso machines, oh-yes ...and a lot of cowboy-hat-wearing-fogeys) and checked out the local bookstores. Sunday morning, we broke camp and drove into Red Lodge, did some camping gear shopping and then proceeded up the Beartooth Highway with great anticipation (we had heard so much about it). The drive was beautiful, but I would definitely avoid driving it in the late afternoon, next time, as it has a lot of tight switch backs either pointing straight into the sun or away from it. Thus, the afternoon shine got a bit in the way of some of the views. But given the amount of climb, how could the view be anything but mountainous, snowy, craggy and Big! We went past two gates and got dissed by the third. Road closed -and at the very crest of the drive too! We savored a 200-meter cruise into Wyoming before hitting the gate and then turned around to find a place to camp, in Montana. That night, we camped at 10,300 MSL. Meanwhile, I did some light reading on the subject of altitude sickness. In the morning, we made a short ascent up a moss-over-grown talus slope. At the top we had hit an elevation of 11,000 MSL, according to the GPS. We were taking it easy, (with a short 2 hour hike) in light of the altitude. Upon returning to the van and having lunch, we departed our camping spot and drove back down the hill (still a bit disgruntled with the road closure). We reached the bottom of the canyon and decided to take a dirt road (upon the recommend of a friend) to our current camp spot, located across the canyon from last night's camp. Following the last entry we took a morning hike to the Hellroaring lakes in the Beartooth mountains, then headed back to the van and then drove down to Red Lodge to continue our trip. We spent the last part of the week traveling south from Montana. The Beartooth highway was closed, so we went around the Beartooth mountains via the Chief Joseph Scenic Highway to Cooke City, MT. The highway has one of the most scenic views I have seen, with the highway switchbacks twisting back and forth into the valley for miles. A perfect road for riding a motorcycle, and half the vehicles we passed were bikes, even at dusk on a week-day miles from anywhere. Unfortunately there were twice as many groups of deer right on the side of the road as there were vehicles, so I wouldn't ride there in the late afternoon or morning unless you like injections of venison. We ended up at a camp just a few miles south east of Cooke City and stayed there for a couple nights. The campground was empty, but for us, and right on the edge of a small river. This gave us opportunity to clean the van (which sadly needed it), grease the fittings, and give it an inspection. Two days later we headed towards Cooke City. We hit the other side of the Beartooth highway, where it was open, but still under much construction (and not paved for many miles) as the rain hit. Within 20 minutes all of the washing the prior day was for naught. Nothing interesting was open in Cooke City, and fuel prices were a good dollar above anywhere else, so we headed into Yellowstone NP. 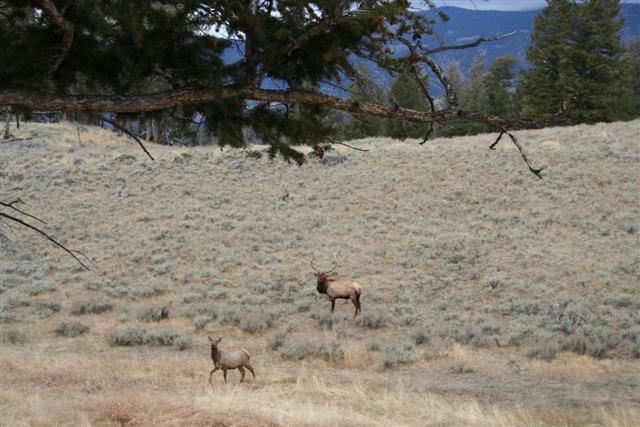 Once in the park the clouds parted a bit, and we got a good opportunity to see herds of buffalo, elk, and deer. Traffic was very light compared to the prior time we visited the park, and we even got snowed on a bit as we crossed the pass heading south towards Jackson, WY. That night we hit Grand Tetons NP around five. All of the normal campgrounds in the park were, of course, closed for the season, so we found a road heading towards the nearby national forest, and lo-and-behold it had small free campgrounds that the park maps and signs don't mention. We didn't pay much attention to the only other tenant of the campground, till they left their damn generator on ALL NIGHT LONG. The next day we packed up quickly and headed towards Jackson, where I had setup a meeting with someone I had met on a motorcycle forum (www.tlplanet.com). 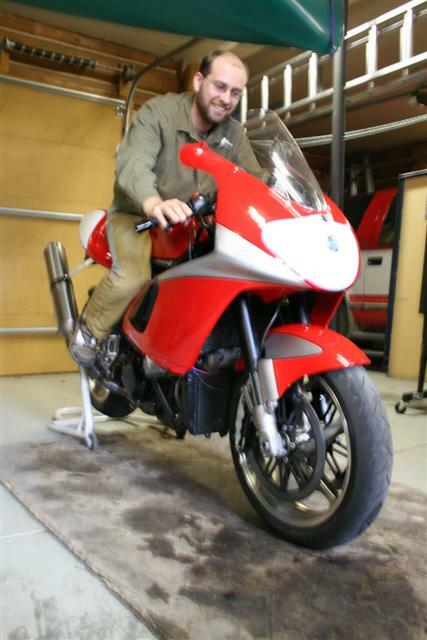 Art had build a custom sportbike using a motor from a bike like my yellow TLR, and a frame from a small company in England. When we are settled down I hope to build up something similar, and wanted to take a good look at it. Art was very generous with his time, knowledge, and even let me sit on the object of desire. I am even more impressed with the bike now, having seen it in person, and definitely will get something like this going once I have a garage again. We passed through Jackson after spending an hour or two drooling on the bike. The town actually has lost some appeal to us after seeing what else is out there, and the prices for property around there are insane anyway. The entire main downtown strip is populated almost entirely with clothing and tourist crap shops. We grabbed lunch at a small cafe off of the main drag, and after Amy did a bit if perusing at the shops we headed south along highway 89. We found a campground in southern Wyoming (near the ID/UT borders), as we didn't see much of interest (of course the clouds were low, and it was raining the whole way) till we wanted to stop. 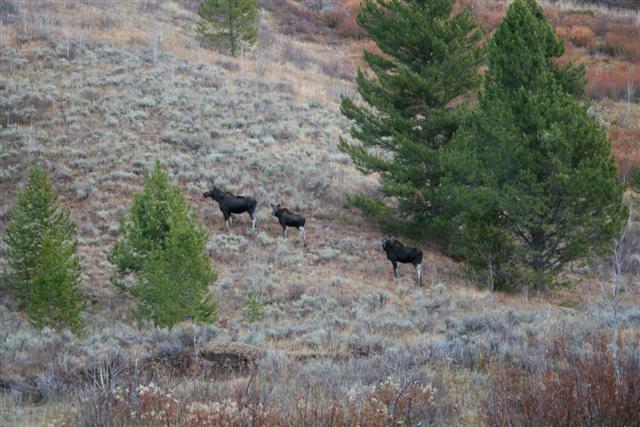 As we were setting up camp I looked out the front window and saw some of the local wildlife passing through. We watched the moose family walk down to some nearby beaver dams, drink for a while, and then head up the next ridge (watching us intently the whole time). Saturday morning we woke up early, and decided to hike up a trail we had seen near the path the moose took the prior evening. We did not see much wild-life, though a number of beaver dams, and a tremendous number of small white snail shells everywhere. After the hike, we returned to the van, packed up, and drove the rest of the way to Salt Lake City, stopping only for lunch, by going up a forest service road in the mountains near Bear Lake and getting a nice snowy view outside as we made sandwiches & gatoraid (our staple meal lately). Amy's sister welcomed us to her home in Salt Lake, and took Amy out to dinner with some friends. I stayed behind and slept after taking a bunch of lovely cold & flu drugs as I have been feeling like low-grade crud for the last few days. 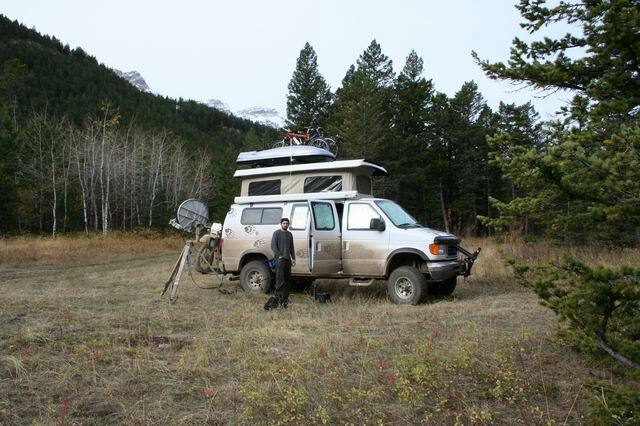 12-2009 - Camping Trip, Breakdown, and lots of Work on Van.